The more time I spent in Nicaragua the more I was open to the “home” that it offered me at every new experience. It seemed that with each experience the gap between culture lessened, my openness grew, and each person was friendlier than the last. Modeling a fire helmet, 2016. 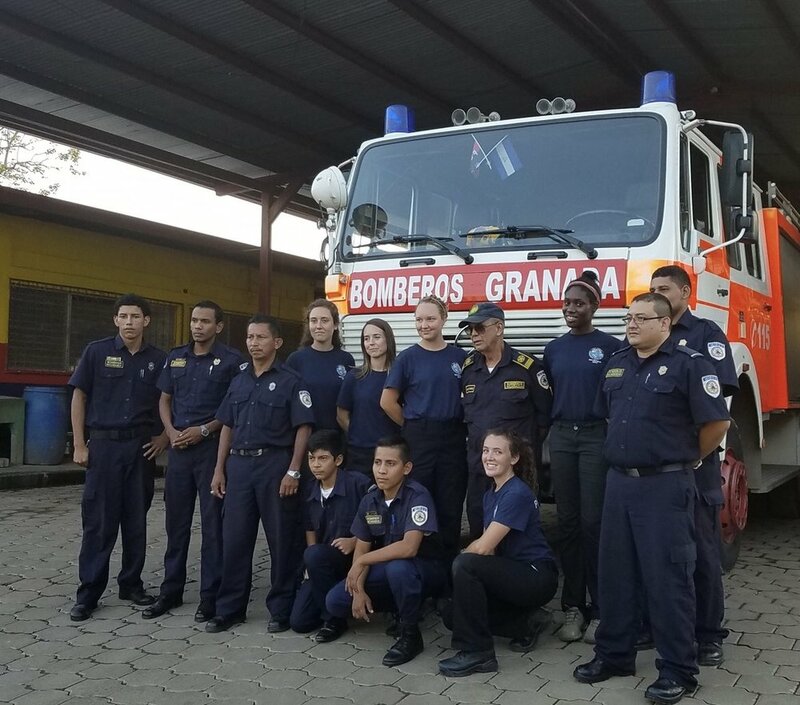 Granada Bomberos and Union College Students. In my last blog, I was headed to live at a firehouse. The Granada Bomberos opened their firehouse to us and allowed us to join their home. We cooked, cleaned, and hung out in between calls. We learned important Nicaraguan preferences like oatmeal is never eaten as a cereal, it can be used for Horchata, but for breakfast, “...we always have Gallopinto (rice and beans)”. The students ran brush fire calls, propane leaks, and community service calls (i.e. beehive removal and sewer drain declogging). Even though we had a language barrier the Bomberos became our friends and opened their home to us. Next we traveled to Leon to begin the tourist section of our trip. Leon is the second biggest city in Nicaragua, was home to their national poet Ruben Dario, and has a Spanish colonial flare. Here we stayed in a newly opened Hostal, the Sleeping Dog. It's owned by a fellow Canadian and comes with a free pancake breakfast and a drooling St. Bernard. We felt at home once again. With Leon as our home base we hiked into the Somoto Canyon for three days. The Somoto Canyon trip was a guided tour by a non-profit charity called Quetzaltrekker and was filled with cliff jumping, star gazing, and profuse sweating. We then exercised our brains, which in Nicaragua also includes profuse sweating (the locals say it's the hottest time of year), by learning about the local culture. We toured churches, a jail, the poet's home, and a cookie factory. It was fascinating to read the history, hear the cultural myths, and to see how people make a living. Leon is known for many things, but my highlight was the food we found. If you ever have the chance to visit Leon there are two food “must stops”: The French Bakery and Del Norte. The first having the best chocolate croissants and the second the best tasting traditional Nicaraguan food for an amazing price. Oh, and we also surfed. We then said goodbye to our group that we'd been traveling with for the last 90 days. They flew back to the United States and we headed to Spanish school in Granada at Sulibeya Spanish Academy. First, just an FYI for anyone staying longer than 90 days in Nicaragua you don't have to leave the country you can go to the immigration office in Managua at the MetroCentro mall. It took us 1 hour and about 20 dollars and our visa was then renewed. I'd looked forward to this mall trip for months because there was a Cinnabon in this mall, but it turns out no one to sell me the fresh Cinnabon. I was so sad...angry...I was never so close to stealing in my life. Nicaragua has many active volcanoes and we visited two with active lava. One of them was volcano Masaya. It was an ominous experience. We got a private tour with a friend to the closed side of the volcano that has the best views of the lava lake. The lava lake sounded like a ocean that also crackled. The heat and sulfur gas were almost unbearable. It's like nothing I'd experienced. Spanish school was the culmination of our time in Nicaragua. It definitely made the words, “...safer and friendlier the world felt” mean something to me. With our two weeks of Spanish School we opted to stay with homestays. Our family was a grandma and grandpa raising their little granddaughter. They welcomed us into their home. They spoke no English and us no Spanish, but they had great patience with us and actually spoke Spanish slowly (an almost impossible task for those who speak Spanish). And they cried when we left. Their home is “mi casa es tu casa”. Spanish lessons were challenging. Four hours a day of class and then about three hours after of study. I definitely learned more Spanish. I even learned that for the past three months I've been calling Nathan my wife, “mi esposa”. When it's actually “esposo”. Yes, we learned about masculine and feminine words. We just touched the surface of Spanish so we have to come up with a plan to continue to learn more. Our final day of Spanish class.